With 125 years of innovation, Philips is now marking another exciting journey with personalized 3D printed shaver. 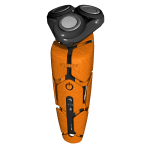 They are piloting a limited-edition personalized 3D printed shaver which enables you to design your own shaver – its shape, dimensions, accessories and colors. You can even have a personal message printed on it. This exclusive pilot is limited to only 125 units – all of which will be individually personalized by people like you, using the latest 3D printing technology. Posted in Fashion and Clothing, News. Bookmark the permalink.